Keurig machines have to be cleaned on the inside every once in a while, and you don’t have to buy expensive descaling solutions. 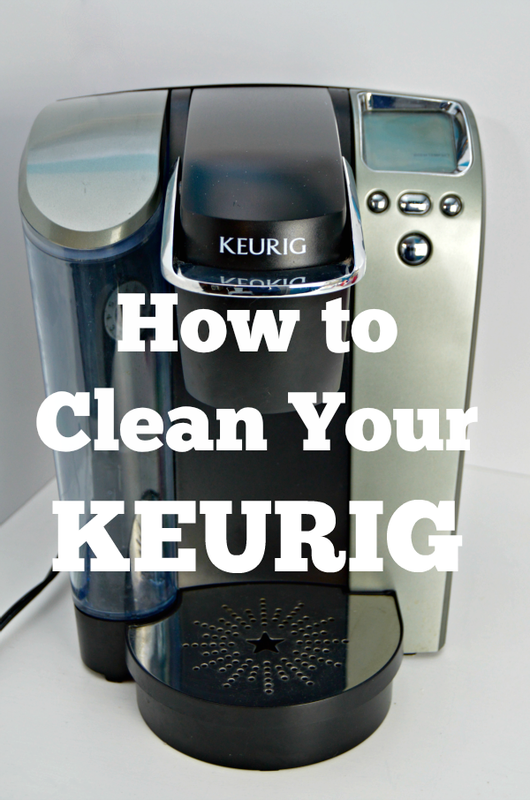 This easy tutorial will show you how to get a clean Keurig machine using a simple household ingredient and a few minutes of your time! I’ve had my Keurig coffee maker for a few years now, and honestly, I bobble back and forth on whether I really want to use it or not. I’ve read a few posts that make me a little nervous about what is going on inside the water reservoir that I can’t actually see. 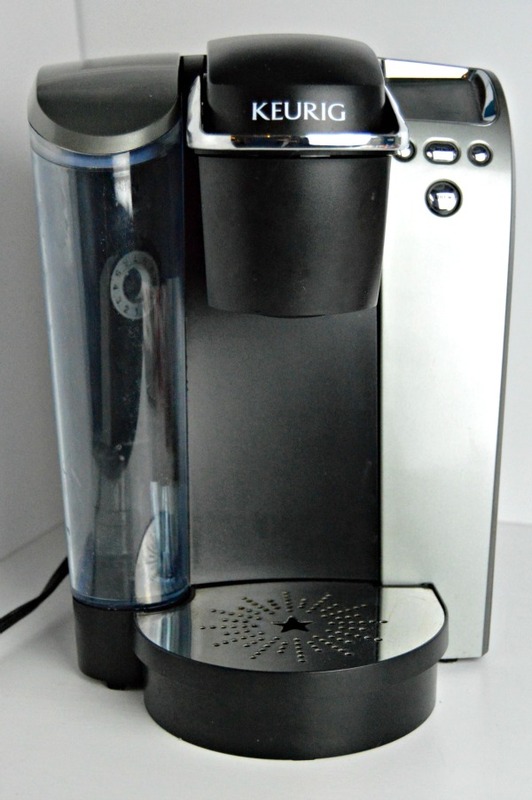 There is talk of mildew buildup and deposits in the backend of the machine, so I think it is a really good idea to descale and clean your Keurig at least once every month or couple of months. It only takes a few minutes and a simple ingredient you probably already have in your pantry. Start my emptying out the water reservoir and filling it with distilled white vinegar. Replace the lid. 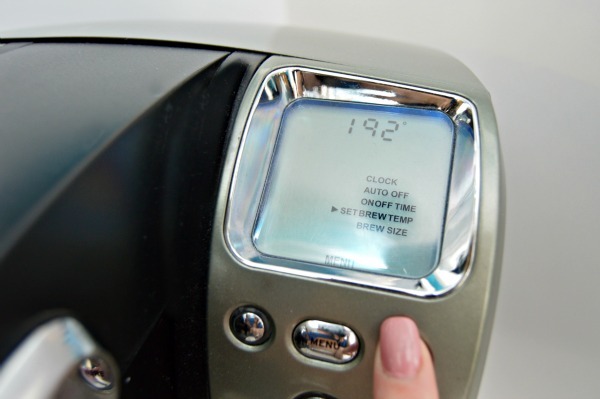 Now set your Keurig’s brew temperature to it’s highest setting. Mine goes as high at 192 degrees. Place a coffee mug or cup onto the base and hit brew. The vinegar will run through your Keurig machine descaling and cleaning all of the tubes and reservoirs as it passes through them. Discard the contents of the cup. Continue doing this step until the side light starts flashing, indicating the the reservoir is running low. Pour out the remaining vinegar and fill with water and repeat the brewing process until the reservoir runs empty again. 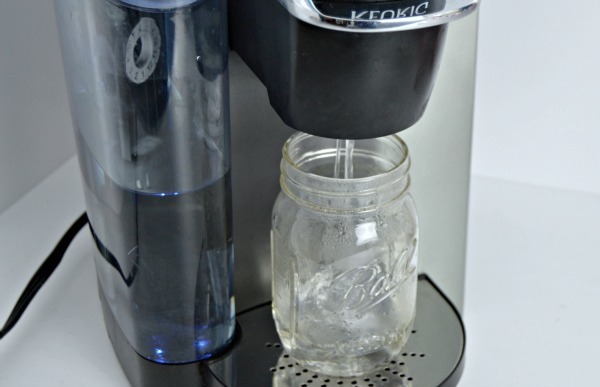 Now clean the water reservoir with a mild dish soap and wipe down the rest of your Keurig machine with a damp cloth and some dish washing solution. 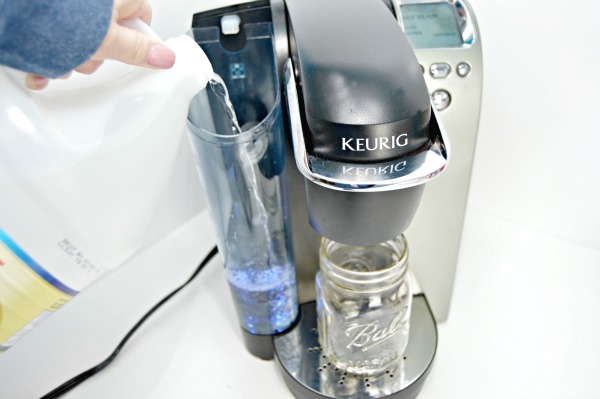 Dry with a clean cloth, and you are ready to use your clean Keurig! 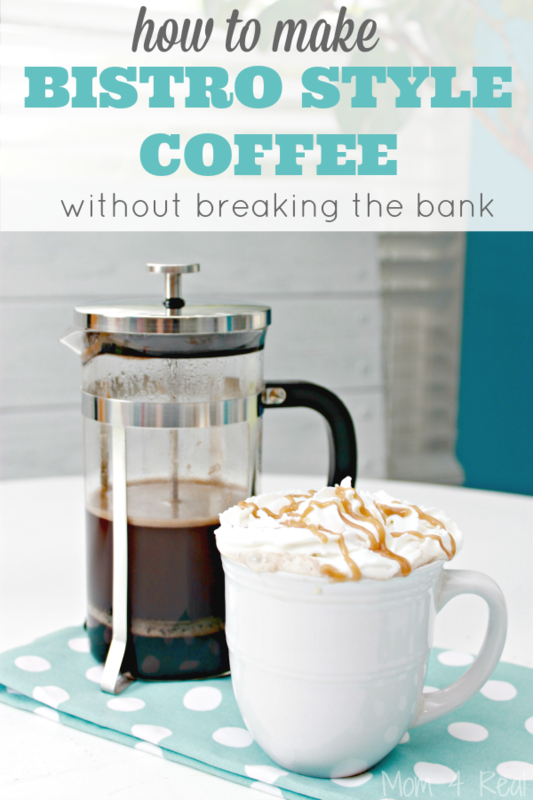 You can read my post on How To Make Bistro Style Coffee at Home if you are looking for a cleaner and safer alternative to coffee machines. In my opinion, a cup of coffee made using a coffee press is so much more amazing than any other cup of coffee. I’ll admit, after getting our new puppy in the fall, I slipped back into using my Keurig because it was so dang convenient, but now that I have a little more time in the mornings (like a few minutes), I am back to using my French press again. Whether you decide to use your Keurig, coffee machine or a press, I hope you enjoy your coffee as much as I do! Great post! I add one additional step when cleaning my Keurig. When brewing the first cup of vinegar or descaling liquid, I turn off the brewer just as some of the liquid starts to pour into my cup. I then let it sit for 15 minutes before turning it back on.This allows the solution to stay in contact with any built up scale present in the tubing. I’ve used this method each time i clean my Keurig 150 and it is now about 5 years old and brewin’ as if it were new. I use my keurig only during the colder season. Is there a way to drain the reservoir during the hot weather season when it is not used? If not, is it safe to use after having not been used for several months? I have the mini brewer. Do I need to descale for the same reason? Hi…After a few years of having the same model that is posted I finally got to cleaning it. My biggest concern is. My coffee cups fill at different amounts. Is this a sign of the machine not working properly or am I missing some sort of setting? I take mine apart (as much as I can) and clean every part of it! It gets gunked up with coffee oil residue especially if you use the “use your own coffee K-Cup”. It gets disgusting inside the cup area too! Yuck!! Thank you for the advice!! Thanks for email on cleaning my Kerig coffee maker. I use my own coffee in reusable Kcups. I forget to deep clean my machine, so I appreciate the reminder. I am now looking through the rest of your reminders. Woohoo…my father was just complaining about his Keurig making noises and I asked him if he has ever cleaned it….NOPE..I just knew that you would have the answer for me! Thank you so much for all your work you put into this site as it’s helped me sooooo many times! I’m from Lexington but now live in Las Vegas for the time being, but I can’t wait to get back there and see some BLUEGRASS!